Mark Rayner has a solution for soggy or uneven ground. For a 4.8m long path you need: Fourteen 1.2m rough sawn fence palings, four 2.4m H4 treated 100mm x 75mm fence posts, twelve 500mm H4 treated building pegs, strip of 10mm plywood or timber moulding as a spacer, 75mm grooved decking nails, 100mm galvanised nails, saw, hammer, electric sander, pencil, tape measure, spirit level, set square, spade and mallet, paintbrush and Resene Woodsman Decking Stain tinted to Resene Warm Kwila. 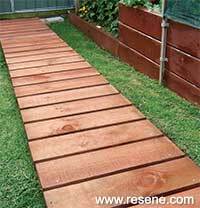 To get the look: Mark stained the raised beds with Resene Woodsman Penetrating Oil Stain tinted to Resene Oiled Cedar. Note: Apply weedkiller to the lawn between fence posts to discourage weeds from growing through the boardwalk. 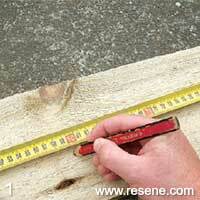 Measure and saw each fence paling in half. 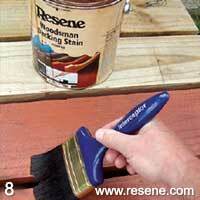 Stain the fence posts with two coats of Resene Woodsman Decking Stain, allowing 24 hours for each coat to dry. Lay fence posts in position, approximately 550mm apart. Dig two shallow channels to accommodate them. 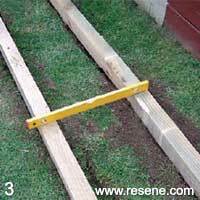 Ensure posts are level and the correct height for the finished path. 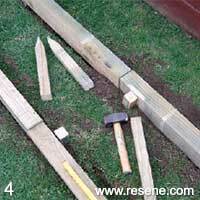 Bang pegs into the ground with the mallet at the ends and centre of each fence post, as shown. 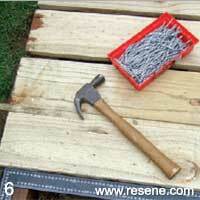 Then attach the pegs to the fence posts with two 100mm nails. 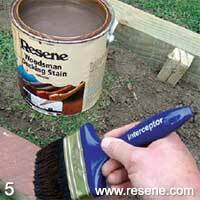 Nail each end of the fence paling lengths (stained side down) to the posts with two grooved decking nails. 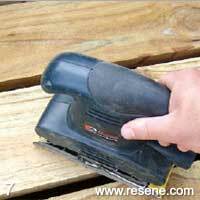 Use the 10mm piece of ply as a spacer between planks and the set square to keep planks at 90°. Lightly sand the boardwalk to ensure no splinters or rough edges remain. Measure and saw each fence paling in half. 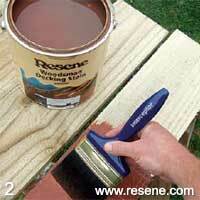 Apply two coats of Resene Woodsman Decking Stain to the boardwalk, allowing 24 hours for each coat to dry.